👋Register here for a training recording about how to take advantage of the latest updates: AND/OR conditions and using rules to trigger other rules. Front's rules engine allows you to automate your workflows. Rules can help you handle repetitive tasks to save time and increase your team's efficiency in Front. This article will help you understand how rules work. After reading, go ahead and try to create a rule. For examples of popular rules, visit our Rules Directory. There are two kinds of rules: team rules and individual rules. Team rules are applied to any shared inbox and can only be created by Admins. Individual rules will apply to your individual inbox and internal discussions. Rules are made up of three types of conditions: triggers, filters, and actions. See here for a full Guide to rule conditions. 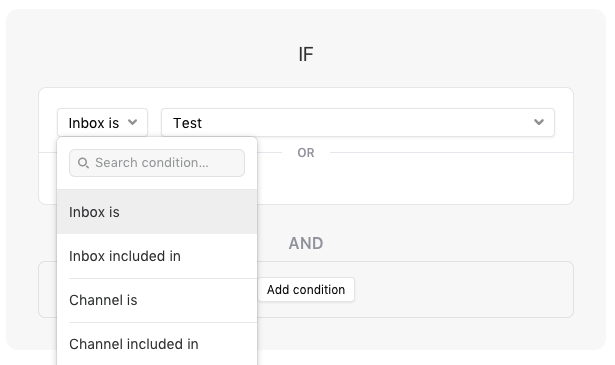 Triggers specify the types of events that will cause Front to start evaluating the conditions of your rule and see if they are met. Filter conditions are the criteria that determine whether a rule will be actioned on. More on how to use And/Or statements can be found in this article. Actions specify the actions that will result when the rule is processed successfully (when all filters are met). You have the option to check off Stop processing other rules to prevent the actions of the rule to trigger other rules. You are able to order your rules if you want certain ones to take priority over others, in the case that there are conflicts in the rules actions. This means that the one ordered higher will have its actions take precedence, and the lower rule may only apply some of its actions so as not to conflict with the other. Time-based rules are special, in the sense that they will only be processed if the conditions are met at the designated time. Use the arrows to the left of each rule (upon hovering) to adjust rules up or down the list. Because Rule #1 is processed first, the Company tag will be added. This will create a conversation tagged action, which allows for Rule # 2 to be triggered. And because the Company tag is present, the second rule is processed and the conversation is now assigned to Andersen. 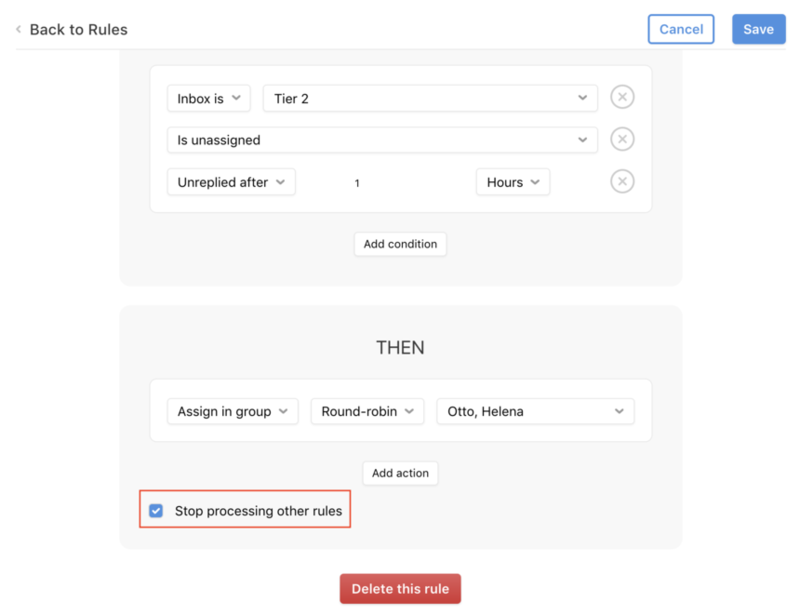 If a rule action moves a conversation to a different inbox, subsequent rules will not work on this conversation because it now belongs in a different space. If a rule action assigns a conversation (or if a conversation is already assigned), a rule cannot re-assign it. If after a rule is processed, and you don't want subsequent rules to apply, check the Stop processing other rules box. When this option is checked, subsequent rules will be ignored even if they would apply to the conversation. The exception to stop processing are time-based, or scheduled, rules. Rules with Unreplied after or Unassigned after conditions are scheduled by time, and therefore are not taken into consideration as a rule to be stopped. 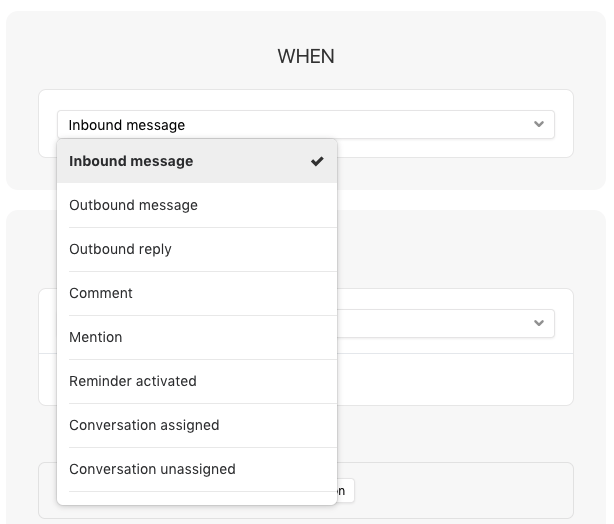 Sending a canned response will not trigger a rule with an outbound reply condition. Moving a rule from an individual inbox to a team inbox, or from one team to another team, will not trigger a conversation move rule in the new inbox. A conversation that is already assigned cannot be re-assigned by a rule. The timezone that you are in when creating the rule is the timezone that the rule will act on. If you modify the rule in a different time zone, we will detect this and the change will automatically be made. How does the "time is between" condition work? When using a Time is between condition, if you set your time to be between 9 pm - 9 am for Monday - Friday. Front will take into account Friday 9 pm to Saturday 9 am. I cant get rules to work. Simple one that when I assign a tag it should move boxes - anything I am missing? Sorry I'm just now seeing this. Did you ever get it to work? Jean-Paul Horn can you explain this a bit more? Are you looking for something like "if this rule is triggered, override other rules" or what? I have a rule that assigns a message to a teammate based on contents of the message, and another rule that notifies all team members if this message is not assigned. However, it seems everyone on the team is still getting the notification even if the message is assigned to the teammate, using the first rule. I have the rules ordered so that the "assign to teammate" rule is processed first. Considering the message is then "assigned" shouldn't that prevent the second rule "notify all teammates" from processing? Is there an action to follow a conversation? Micah Kohne Hi, and sorry for the delayed reply. Can you please send an email with the names of these rules so that we can investigate? Thanks for the reply Cori Morris - I added a delay to the second rule to check if the message is assigned and that makes it work properly. Is there a way to make a rule be case-sensitive? roundedbygravity Not at this time. I will share this request with our product team, though. Cori Morris , I can add a personal tag to the messages in our shared team inbox but is it also possible to create a team rule that adds this (personal) tag to a message received in our team inbox? Rolf Dröge Not at this time. I'd be happy to share your request with our Product team, though. Hi. After the update, when we send outgoing emails, they are not archived in our team inboxes. We have a rule that moved send email to shared inboxes. But the are opened again, when moved. Even if we send and archive. How do we get the sendt email to be archived in the shared inbox? Hi Søren Rynkebjerg please send us a request (as we'll likely need some information sensitive to your account) you can use the contact form on our Help Center thanks! I want to archive auto-replies and for this I want to use headers matching. For example, if this header is present and one of the values is "OOF", I want to archive the message. IF has header-key "x-auto-response-suppress" AND header-value contains "OOF"